Jennah Truitt certainly has a way with children. She’s already the godmother for several friends, and she was recently named Lord Baltimore Elementary School’s Teacher of the Year. Kindergarten is the first formal schooling that many young children experience. Jennah Truitt remembers that when welcoming kids to their first-ever day of school. By working hard to ensure a happy classroom, Truitt earned Teacher of the Year for 2018-2019 at Lord Baltimore Elementary School. Truitt is dual-certified and teaches an inclusion classroom, which means children with special needs or individualized education plans (IEPs) are included in the traditional classroom. She was also LB’s Special Education Ambassador this year. The work is hard, but the rewards are lovely, she said. “Each child is unique, for sure, and I love meeting their individual needs,” Truitt said. “They come here and they seem so little, but when they leave here, they’ve grown so much,” educationally and emotionally. This is her first Teacher of the Year award. Truitt was nominated by a stack of families, some nominations written by parents and some written in the wobbly, but unquestionably devoted hands of the children themselves. “Miss Truitt cares about us. We do fun activities,” a child wrote. That happy atmosphere is the result of hard work. Her colleagues wrote of her “herculean efforts” to partner with parents to overcome children’s learning difficulties. “Teaching is not an easy profession in many different ways, but you just take ’em as they come,” Truitt said, emphasizing the importance of mentors and coworker support. Learning and working in the IRSD her whole life, Truitt said she feels fortunate to have been inspired by many. An alumna of Indian River High School, she is also working on a doctorate. 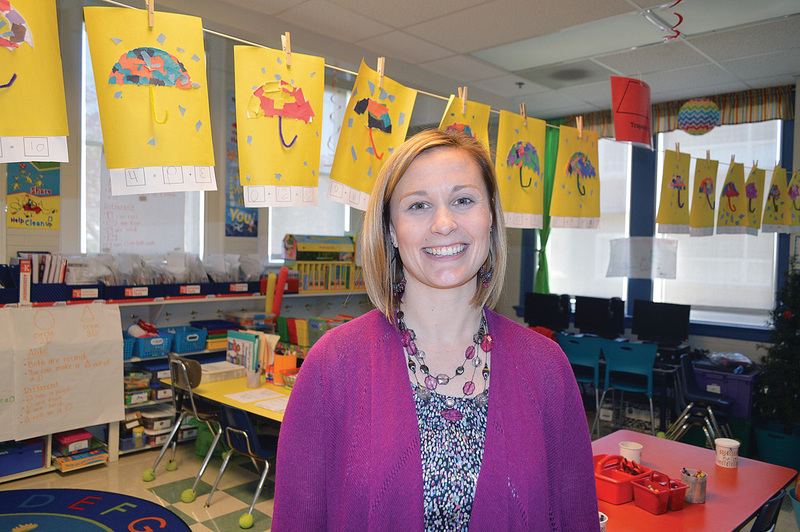 Truitt earned her bachelor’s degree in early childhood and elementary education from Salisbury University and her master’s in curriculum and instruction at the American College of Education. Before these three years at L.B., she taught four years at Long Neck Elementary School. She currently serves on the Positive Behavior Support Committee and helps mentor up-and-coming teachers. She seems destined for teaching. After a childhood of playing school at home, a teenage Truitt taught dance classes at Millsboro’s Dance Alley. That studio is like a second family for Truitt, who started dancing there as a 3-year-old, and still teaches and coaches the dance troupe. When not teaching, Truitt is a proud aunt who fills her time with the beach, friends and family.